I have always been a fan of George Chuvalo and was thrilled to have met him last year. He has seen great times and devastating times during his life, which are all told in Chuvalo: A Fighters Life. The inspirational memoir of the Canadian boxer who fought some of the greatest heavyweights in history, including Muhammad Ali and Joe Frazier, but lost everything outside the ring. From a tough Toronto childhood as the only son of immigrant parents, through a twenty-three-year career that earned him induction into the World Boxing Hall of Fame, to the public tragedies that decimated his family long after the cheering stopped, George Chuvalo tells his life story as only he can. Chuvalo traded punches with several all-time greatsJoe Frazier, George Foreman and, most famously, Muhammad Ali (twice)yet in nearly one hundred bouts, he was never knocked down. But his biggest fight came after he hung up his gloves, when drugs and suicide devastated his family. 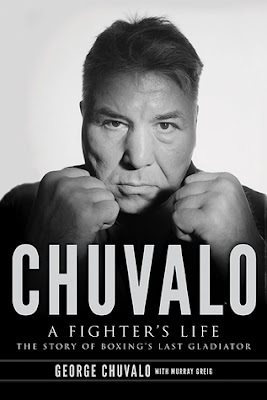 Chuvalo is both a top-flight boxing memoir and a poignant, hard-hitting story of coping with unimaginable loss. Chuvalo held the Canadian Boxing Championship longer than any other boxer. Although he had fought the worlds greatest contenders and champions of his era, he was never offered a shot at the British Commonwealth Championship even though he fought the worlds greats contenders and champions of his time, and had legendary fight in 1966 at Maple Leaf Gardens with World Champion Mohammed Ali in Toronto after being notified of the fight just 17 days before. He retired from fighting in 1978 as the Canadian Heavyweight Champion at the age of 41 with a record of 72-19-2 with 63 knockouts. Chuvalo is famous for never once being knocked down in a fight. Chuvalo should have better financial paydays and an even more prestigious fight career but made the mistake of signing a long term contract with Irv Ungerman, who knew nothing of the fight game, and was in it only for the financial rewards he could funnel away from Chuvalo. In this book he is very open and honest about his life after boxing. Many of his immediate family, wife and sons, suffered from drug addiction which ultimately led to drug overdoses or suicide. I really enjoyed this look back on his life and highly recommend this book.